Through our affective feelings, we can apprehend truths about self and world. There are, of course, cases in which an emotional upheaval embodies a false impression; yet it is susceptible to being false, or true, because it presents the world as being a certain way. 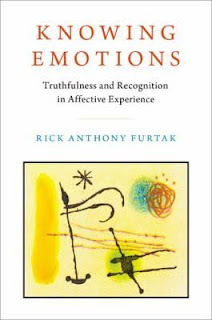 Weighing the relevant empirical evidence and theoretical arguments, Knowing Emotions begins with a discussion of how truthfulness is at issue in episodes of such emotions as anger, fear, grief, and the like. Even apparently irrational emotions can actually show us what distinguishes emotion from other modes of cognitive activity: the turbulent feeling of being afraid is our way of recognizing a potential threat as such. What is disclosed to us when we experience fear can be either a misconstrual of something harmless as a danger or an accurate perception of an axiologically salient fact about the world. Yet only a being able to perceive itself as threatened is susceptible to becoming afraid. In the later chapters of Knowing Emotions, I turn to the background conditions of affective experience: for instance, why it is only if we care about the life and well-being of a person that we are disposed to react with fear when that person is threatened. Our emotional dispositions of love, care, and concern serve as conditions of possibility for the discovery of significance or value, enabling us to perceive what is meaningful. We must reject as misguided the aspiration to purify ourselves of passion and attain an impersonal standpoint. This book attempts to clarify what kind of truth may be revealed through emotion, and what can be known — not despite, but precisely by virtue of, each person’s idiosyncratically biographical perspective. This book is unique in numerous ways. It approaches its topic in terms that will be familiar to readers acquainted with recent Anglophone philosophical work on emotion, and also to interdisciplinary researchers in affective science. Yet its frame of reference is wide and eclectic, and it draws on the insights of phenomenologists such as Merleau-Ponty, Scheler, Heidegger, Sartre, and Marion, as well as literary philosophers such as Kierkegaard, Nietzsche, and Thoreau. It is deeply informed by engagement with empirical findings in social psychology, neuroscience, and psychiatry. Yet it makes judicious use of these sources, and finds that some empirically minded philosophers of emotion have not been cautious enough about making bold and sweeping generalizations based on limited evidence, and have put forward faulty claims about the nature of human emotion as a result. Most importantly, Knowing Emotions makes a distinct contribution to the study of emotions, giving an account that does justice to all varieties of affective experience, from brief episodes to moods and emotional dispositions, loves and other longstanding concerns, and overall features of temperament and affective outlook. It offers a resolution of problems, such as how to reconcile the bodily and cognitive aspects of emotion, that have plagued other theorists in this field of inquiry. And it gives a cogent account of emotions and their importance in human life, not for their own sake but due to what they are capable of revealing. This book illuminates affective experience in a manner that will be available to everyone from scholars and students to general readers.